Construction work for the new Lima Convention Centre is progressing full speed ahead at the San Borja District of Peru’s capital. The project, which represents an investment of 173 million dollars and has a scheduled timeframe of only 15 months, will give rise to a building of tremendous size and significance: The venue will be hosting the Annual Meetings of the Board of Governors of the World Bank (WB) and International Monetary Fund (IMF) in October 2015. The Lima Convention Centre spans an area of 85,441 m² (119,683-ft.²) in a predominantly residential district. The building, which rises 10 floors above ground level, also features four underground parking levels that can accommodate more than 900 vehicles. Eight floors of conference rooms offer 14,925 m² (160,651 ft.²) of meeting space with a total capacity of 9,950 people. The top floor features an impressive single exhibition room covering 5,250 m² (56,510 ft.²). Peruvian Housing Minister, Milton Von Hess, told Peru This Week, "That puts (Peru) at the international forefront of capacity to hold international events." In November 2014, Grúas y Maniobras prepared its Superlift 3800 crawler crane for the 25-kilometer (15.5 mi) journey from the company’s headquarters in the San Juan de Lurigancho District to the east side of Lima, where the future Convention Centre will be located. Transporting the enormous crane, as well as its boom sections, counterweights, and fixed jib, took a total of 35 transportation vehicles – a relatively small number considering the equipment’s enormous size. Once the crane components made it to the convention centre construction site, Grúas y Maniobras’ crew of 12 had the Superlift 3800 crane assembled and ready for work in only four days. 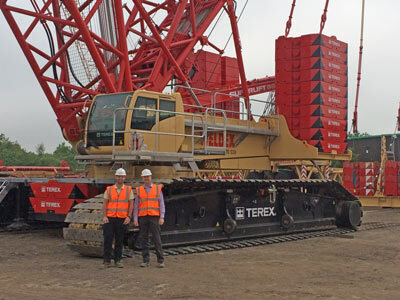 Among the lifting equipment at the project site, the Terex Superlift 3800 crawler crane dominated the landscape as it towered over all the other cranes. For the heavy lifting, it was equipped with 96 m (315 ft.) of main boom, a 12-m (39.4-ft.) light fixed fly jib and Superlift structure to help boost lift capacities when working at maximum radius. Full counterweight of 165 tonnes (182 US t) was positioned on the variable-position Superlift tray and another 50 tonnes (55 US t) was placed on the super structure. Grúas y Maniobras used the crawler crane to lift and install the building’s preassembled beams and girders. "The segments weighed up to 40 tonnes (44 US t) each, and we worked the crane at a maximum radius of 90 m (295 ft.) and a height reaching 38 to 40 m (125 to 131 ft.)," mentions Torres. This was well within the Superlift 3800 crane's capacity of 58 tonnes (64 US t) when working at this radius. Operating a crane of this size in a residential area can be challenging, but the crew and Superlift 3800 crawler crane were up to the task. The obstacles in the way of the lifts included banks, a government building, and heavy vehicle and pedestrian traffic. “However, the crane features extremely precise controls and is easy to operate and manoeuvre, so performing the actual lifts ended up being quite easy,” Sánchez adds. Depending on the phase of construction, crews performed an average of 12 heavy hoists every day with the crawler crane. Working on a large structure spanning more than 8.5 hectares made it necessary to move the crane a number of times, but, according to Sánchez, the fact that they were able to use the crane with a very large radius made a significant contribution to the lifting operations’ efficiency. “Thanks to the Superlift 3800’s capacity, we needed to move it fewer times, and the time saved as a result meant we were able to cut down on man-hours and other costs,” he continues. The crane’s ability to move by itself using its crawler system was another point in its favour when it came to the project’s requirements. This is reflected in the fact that the crane has moved the equivalent of a total linear distance of 3,000 meters (1.86 mi) since its arrival at the construction site. The unit’s extraordinary performance during the Lima Convention Centre project means that Grúas y Maniobras has found a crane that meets their capacity, precision, mobility, and manoeuvrability needs. “We’re definitely planning to use our Terex Superlift 3800 crawler crane for large-scale projects throughout Peru in the coming years,” Sánchez concludes.